Following on from the success of The ABC’s of Death, there is the inevitable sequel. And, once again, there is one letter up for grabs, where filmmakers can submit a short film and viewers get to vote on who should win. The letter this time around is M, and I have already watched a few submissions, of varying quality. 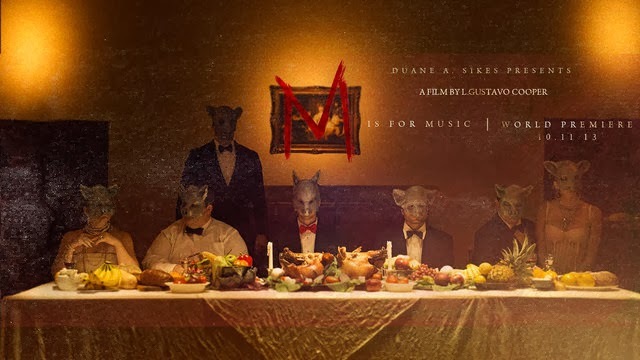 M is for Music, however, is one that I have been excited about, as it was written and directed by L. Gustavo Cooper, who directed the excellent Velvet Road and the upcoming Copiii: The 1st Entry. The first thing I noticed about M is for Music, aside from the pig masks, is the absolute decadence that drips off the screen. It’s as if Eyes Wide Shut was condensed into 3 minutes and shorn of its many pounds of excess. Whether or not a comparison to the late great Kubrick is warranted or not, depends on your views on his final, and flawed, movie. M is for Music is a decadent piece though, set entirely in one room where a pair of violinist dual against each other, much to the pleasure of a group of wealthy-looking viewers. You may not think that violinists dueling would be all that horrific, but you would be wrong, and as the music flows, so does the blood. Cooper has shown, in his previous short and the trailer for his upcoming feature debut, that he has a wonderful eye for film. Despite its minimal location, this is an absolutely beautiful looking film; in both its aesthetic appeal and technical prowess. I really wish more filmmakers would dive into short films before tackling a feature film, such as Cooper and filmmakers like Richard Powell have. Both have created honed their skills and created excellent shorts, and M is for Music is quite excellent. In a world where attention spans shift in minutes and seconds, rather than days or weeks, I have made a point of following Cooper’s career thus far, and I can only see good things ahead. Whether or not M is for Music wins the coveted spot in The ABC’s of Death 2 remains to be seen. However, I can see his career heading forward in leaps and bounds, based on the quality of his output so far. You can check out the film itself at the bottom of this review, and make your own mind up. For me however, this is a classy, bloody and thoroughly enjoyable 3 and change minutes.